The good news: Lucas is starting to smile! The bad news: I cannot get a good picture of it! Below is the best I could do...and he was moving, so it's blurry! Anyone know how to sharpen an image even more than this? I've already sharpened it as much as iPhoto will let me...but if there's a website or something I can sharpen it on even more, let me know! Ugh! Anyways...Lucas thought the week before last was a little too boring, so he decided to spice it up for us this past week, to say the least. 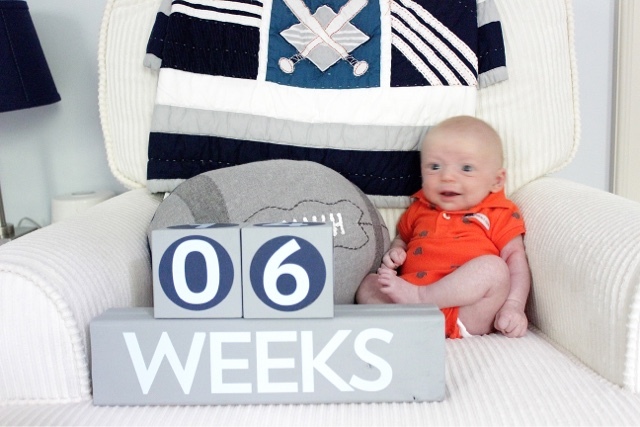 Thursday was his one month checkup. He has grown TONS and weighs almost 10 pounds now! He's over a pound heavier than Ella was at this point. They also checked his hemoglobin...and it came back really, really low. 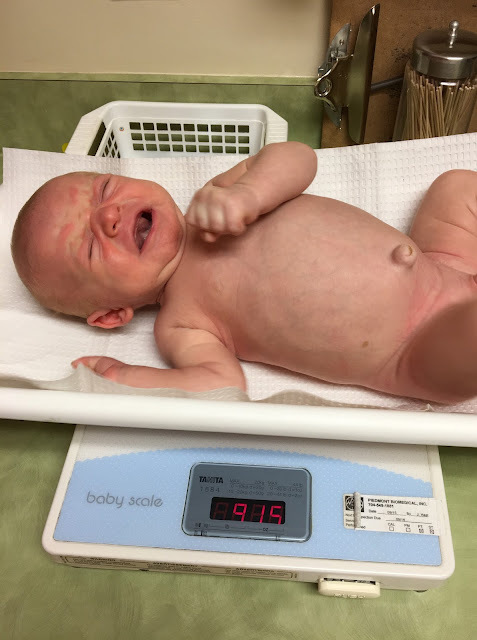 Like, the pediatrician almost didn't believe how low it was. So she sent us to the lab to get a re-draw just to make sure. So, his hemoglobin was even lower when the lab ran it...which meant another blood transfusion for Lucas the next day. While they were with Ella, I went with Lucas to an outpatient facility (thank GOD we didn't have to get re-admitted to the hospital!) to get his transfusion. Funnily enough, the doctor who is now working with us out of this office was the doctor who got honored at Trav's work gala this past October, while I was 8 weeks pregnant with Lucas....little did I know then! But we know we are in good hands; I have been really impressed with her so far! It took the nurses FOREVER to get his IV in, which is why he looks like a Christmas tree...they had to poke him a bunch of times, trying different veins. Poor guy. He was a trooper though! The worst part of it was that it was SO boring. Thankfully, we got our own private room (they called them "cabanas" HA!) and I could watch Real Housewives, but still...watching blood drip for 6 hours is not my idea of a fun Friday! The nurses and doctor were really optimistic though and think this will probably be the last transfusion he needs! Luckily, we had TWO birthday parties last weekend to lighten things up a little bit! First up was Jackson's fire truck party Saturday. And then Gigi's farm birthday party on Saturday! And yes, there was a petting zoo there! Homegirl sure loves birthday cake! Monday we had a playground playdate with some friends! 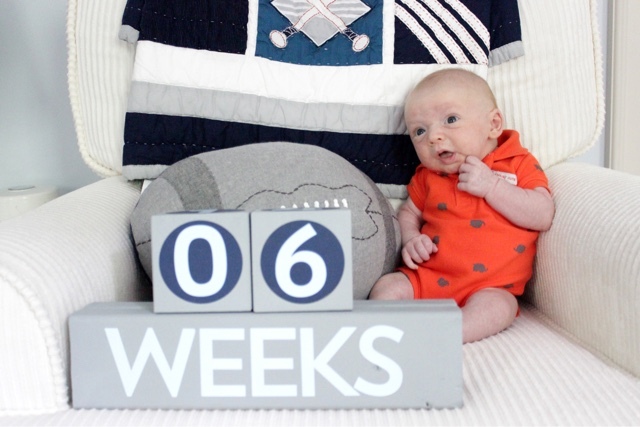 Tuesday was my 6 week postpartum check up. FUN TIMES. Also...why do they make the rooms at the ob's office so freaking small?! Don't they know people bring their kids sometimes?! Since I got the green light to work out again, I hit the treadmill first thing Wednesday morning! Both of my workout buddies were surprisingly well-behaved while I ran! But oh man, those 3 miles were ROUGH!!! It has been a hot minute since I exercised and I am SO sore today! We also started packing for the beach!! Look out, North Myrtle...we're coming for ya! I love how much Ella loves birthday cake! A girl after my own heart ;) Enjoy the beach and your 4th of July Weekend! Aww, poor Lucas! Hopefully that is his last blood transfusion! Hope you have a great time at the beach! !